It’s Monday and Katherine Anne Confections is closed, for this is the day when the magic happens. When pure, organic ingredients, and exotic and familiar flavors are made into some of best caramels, hand-dipped truffles, and fluffy marshmallows in Chicago. Upon entering the shop, the unmistakable aroma of chocolate evokes memories of childhood and comfort. A quaint seating area makes you feel like you’re in someone’s home, and a few tables and chairs along the windows are reminiscent of an old ice cream parlor. The kitchen area is in the back and is visible to customers. Crystal chandeliers light the small space, and warm wood surrounds the chalkboard filled with the day’s specials. Jars of caramels and marshmallows line the counter, each bearing a hand-lettered label of its contents. Marshmallow flavors like Tea and Passion Fruit, Vanilla and Black Pepper, Champagne and Rose Petals, and Spicy Hot Cocoa are here, along with Salted Bacon, Banana Bourbon, Rosemary Sea Salt, and Peanut Coconut Chili Lime caramels. Glass stands hold truffles of Port and Blue Cheese, Mayan Cherry, Passion Fruit Ginger, Java, and Raspberry Rose — each rolled and hand-dipped with a thin layer of chocolate. The atmosphere is relaxed. Music is playing while owner Katherine Duncan sits answering email in one of the green velvet-covered armchairs usually reserved for customers. Workers chat among themselves while going about the business of making candy: dunking bite-size truffles into velvety chocolate, making precise measurements for the next batch, and slicing slabs of marshmallow into cubes. We sat down with Katherine to talk about the shop, how she got started, and where she finds inspiration. KA: I wanted to be in Logan Square for a couple reasons. Right now it’s less expensive than some other areas in the city, but I knew it was an awesome neighborhood, very up-and-coming. In five years, this area is going to be so different. We’ve had this space for three years, been open for a year and a half, and have seen some dramatic changes in that short time. How did you start making candy? KA: I grew up in Wisconsin on a 200-acre farm. The nearest neighbor was a mile away, and there weren’t a lot of them. We would make caramels every holiday season for family and friends. I don’t remember how old I was, but we would go into the local co-op and sell every member a bag of caramels. How did Katherine Anne Confections come about? KA: I grew up making confections and it’s what I knew. I moved to Chicago when I was 18 and I would make candy for friends around the holiday, just like I did back then. One year, I remember a friend wanted more about a week after Christmas. He said he gave his truffles to his mother, and she ate all of them. That’s when I realized it was special and started to think seriously about doing it full time. I was 22 at that time and at a job where I was about to get a promotion. I knew that if I didn’t do it then I’d maybe never do it if I took that promotion. So I turned it down. KA: There’s something about truffles that makes them very popular. In early February, 95% of our sales was truffles because that’s what one gives for Valentine’s Day. We sell individual caramels to coffee shops and that propels them to the top of the list. Some weeks we make 5,000 individual caramels. Everyone loves caramels, and homemade caramels are the best. Marshmallows haven’t quite taken off – yet. 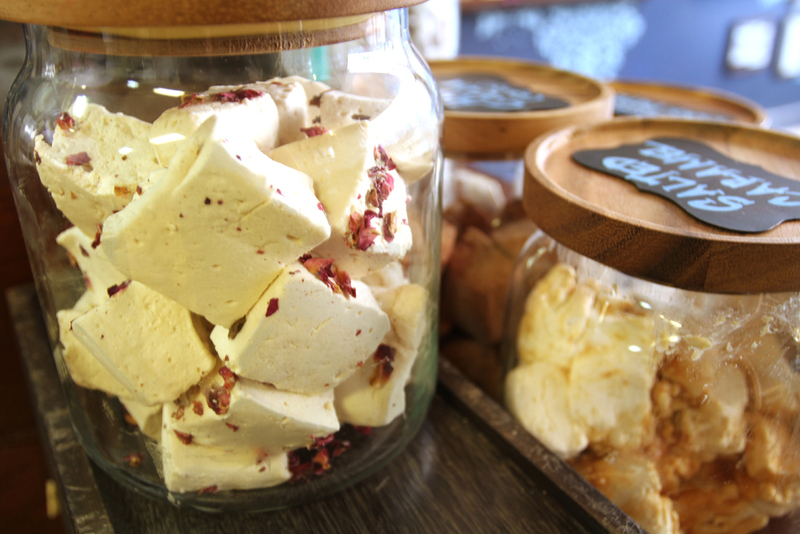 The artisan marshmallow trend is just starting, so it’s still new and exciting for a lot of people. People don’t even think they like marshmallows because they’ve never tried a homemade marshmallow before. KA: I love the design process. The business is set up so that we are constantly designing new confections. We have a new caramel every week. Each month, there’s a new non-dairy truffle and a new chocolate-dipped truffle. In all, we have more than 200 new flavors every year. These are in addition to our past favorites. That’s what I really enjoy. Where do you find inspiration for your flavors? KA: Desserts, of course. Cocktails are also a big inspiration. We do a Dark n’ Stormy truffle with ginger beer and dark rum that’s amazing. But inspiration sometimes comes from the most unusual places. A couple years ago, I had a birthday dinner at Charlie Trotter’s. One of the items on the non-alcoholic tasting menu was a duck breast paired with a drink of cherry juice and Earl Grey tea. Since then, I’ve used cherry and Earl Grey quite often. It’s a perfect combination. You work with a different chef each month to design a truffle. Any stand out for you? KA: It’s so much fun. We always do something new and exciting, and they have all been delicious. One that comes to mind was Bill Kim (of Urbanbelly and Belly Shack), who’s a really inspiring guy. He designed the most complex truffle to date. It was a curry truffle with milk and semi-sweet chocolate, tapioca pearls, candied walnuts, kefir lime leaves – and I’m sure forgetting something… it was so involved, but it made a wonderful truffle. One of our most polarizing truffles came from Eddie Lakin (of Edzo’s Burger Shop). It was a caramelized onion, balsamic, and sea salt truffle. It was a bit confusing to the palette and people either loved it or they didn’t. It was definitely tasty. Tell me about your staff. What’s their background? KA: Getting to choose who I work with is amazing, and I get to meet some of the coolest people. I look for people who are great at their jobs, like to have fun, and have passion for life, whatever that may be. They don’t necessarily have to be from the business. People gave me a chance and I want to do the same for others who want to work with me. Some are from pastry school, some have been waiters, some have worked front of house. I look for passionate people, no matter where they come from. You’ve expanded your menu to include soups and salads. KA: I had a craving for a salad one day and discovered there isn’t a lot in the area for lighter food. So by offering a limited menu, we’re providing something that’s a bit harder to find around here. Also, people don’t go out every day for chocolate, especially rich and decadent chocolate like ours. Chicago is a very savory town, but when they want something sweet, they’ll grab a doughnut or pie — both very trendy right now. You don’t see many classic French pastry or chocolate shops in the city. We wanted to offer more. What does the future look like for Katherine Anne Confections? KA: Logan Square is booming. Right now we don’t get a huge amount of foot traffic, but I think that’s going to change in the next few years. One thing I’ve seen change since I’ve been here is that people in the area are not just saying, “we hope you succeed, good luck,” and going elsewhere. They’re really supporting small business. That’s a really cool change in the neighborhood. Katherine Anne Confections is located in Chicago at 2745 W. Armitage, or shop online at katherine-anne.com.